Using needle nose pliers the rear passenger piston turned in just fine...took a while but turned in while pushing and turning clockwise. The rear driver side won't compress...it turns relatively easy but won't screw in. Is there a trick to this? Should I crack the bleeder valve loose? If I do will I need to bleed the brakes? Would "the tool" make it easier? Moved to General Tech Chat, better for most DIY repair questions. 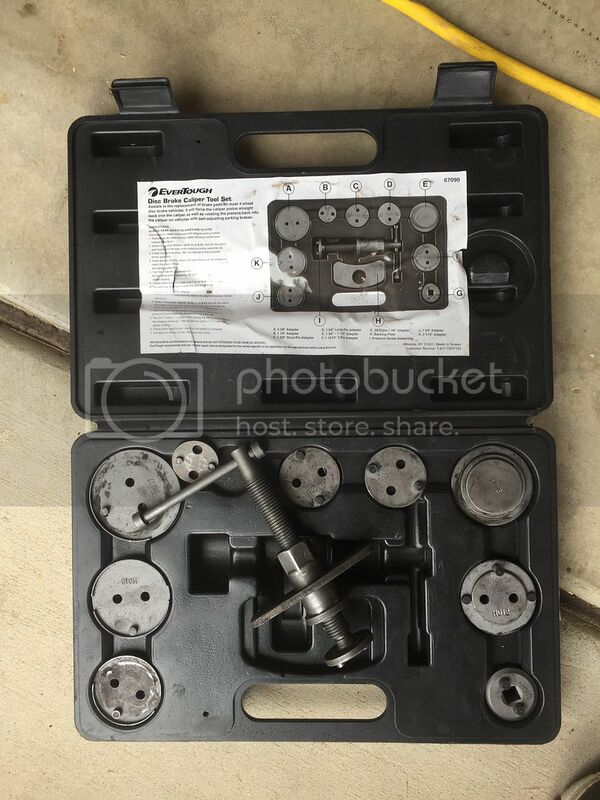 "The tool" covers a wide range these days, from a cube tool to fit the piston for turning it to a set with adapters to fit different calipers that both presses in the piston and turns it at the same time. Pistons don't just "screw in" they need to be compressed as well and doing both can be tricky. Some DO release pressure at the bleeder screw, if you end up getting air in then yes you'd end up needing to bleed the brake there. How lucky depends on your experience with that and the method used, a piece of clear hose to watch fluid come out and only cracking it a little can help. Fluid in hose resists air getting back in when you relax pressure for a moment. Finishing one side before starting the next helps by lowering fluid level in the reservoir before starting the other side, are you checking the level? Thanks Sailor...yes, I'm checking fluid level and yes I'll definitely run a clear hose from the bleeder valve to a catch bottle with a bit of fluid in it. I guess more than anything I'm wondering if these calibers are prone to failure in this way where the piston won't compress? And does using a tool (over needle nose) make the job much easier? I find it odd that I had such an easy time with the one (took me 15 minutes total to remove and replace) and why this one would be so difficult? Check your local part stores, many have a loaner tool program. They should have the brake tool that will let you compress while turning. They just charge you a core charge that you get back when you return the tool. Id try that before just assuming the caliper failed in some way and replacing. What I Drive: 2 cars or a "Further"-style van. It's really not odd that one sticks more than another. Sometimes you will have one move freely and the other be frozen, stuck hard, and needing a rebuild. It just depends on tolerances, heat, and water impurities of the fluid. Also, it's ALWAYS a good idea to bleed out the old fluid, until it runs clear, fresh fluid, every time you have to replace a pad (or shoe). X2, one being harder does not at all mean the caliper is necessarily bad. Water gets in around the parts to varying degrees and some try to seize up but if you get the piston screwed back in it may work fine. Well, thanks for all the help guys! I fought it for atleast an hour and a half last night with needle nose...fought it for another 30 mins this morning to no avail....even backed out the bleeder valve a touch and still no go...went to O'Reilly Auto Parts and rented the tool shown below...took me 10 minutes to collapse the piston and bleed that caliper...Brakes are now perfect. Lesson learned: Don't be a tight_ _ _ and just rent the right tool to begin with regardless of what you read on the internet! Last edited by Fabio0716; 08-27-2016 at 12:11 PM. Reason: Information was not pertinent to thus thread. Just buy a C-Clamp. 7 bucks at home depot. No need to open breeders or the tank (ford manual) . Just very slowly push in the piston as to not damage the ABS. First sign of caliper problems? Remove and replace,save yourself the headache of a rebuild.